Let’s get a more in-depth look at DOM nodes. In this chapter we’ll see more into what they are and their most used properties. DOM nodes have different properties depending on their class. For instance, an element node corresponding to tag <a> has link-related properties, and the one corresponding to <input> has input-related properties and so on. Text nodes are not the same as element nodes. But there are also common properties and methods between all of them, because all classes of DOM nodes form a single hierarchy. 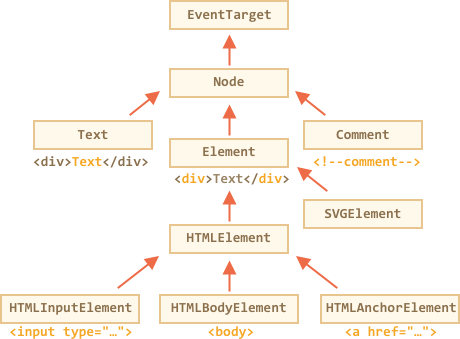 Each DOM node belongs to the corresponding built-in class. The root of the hierarchy is EventTarget, that is inherited by Node, and other DOM nodes inherit from it. EventTarget – is the root “abstract” class. Objects of that class are never created. It serves as a base, so that all DOM nodes support so-called “events”, we’ll study them later. Node – is also an “abstract” class, serving as a base for DOM nodes. It provides the core tree functionality: parentNode, nextSibling, childNodes and so on (they are getters). Objects of Node class are never created. But there are concrete node classes that inherit from it, namely: Text for text nodes, Element for element nodes and more exotic ones like Comment for comment nodes. Element – is a base class for DOM elements. It provides element-level navigation like nextElementSibling, children and searching methods like getElementsByTagName, querySelector. In the browser there may be not only HTML, but also XML and SVG documents. The Element class serves as a base for more specific classes: SVGElement, XMLElement and HTMLElement. …and so on, each tag has its own class that may provide specific properties and methods. So, the full set of properties and methods of a given node comes as the result of the inheritance. …and finally it inherits from Object, so “pure object” methods like hasOwnProperty are also available. That’s also easy to see by outputting an element with console.dir(elem) in a browser. There in the console you can see HTMLElement.prototype, Element.prototype and so on. console.log(elem) shows the element DOM tree. console.dir(elem) shows the element as a DOM object, good to explore its properties. In IDL all properties are prepended with their types. For instance, DOMString, boolean and so on. Other classes are somewhat similar. The nodeType property provides an old-fashioned way to get the “type” of a DOM node. there are few other values in the specification. // let's examine what it is? In modern scripts, we can use instanceof and other class-based tests to see the node type, but sometimes nodeType may be simpler. We can only read nodeType, not change it. Is there any difference between tagName and nodeName? Sure, the difference is reflected in their names, but is indeed a bit subtle. The tagName property exists only for Element nodes. for elements it means the same as tagName. for other node types (text, comment, etc.) it has a string with the node type. In other words, tagName is only supported by element nodes (as it originates from Element class), while nodeName can say something about other node types. If we only deal with elements, then tagName is the only thing we should use. The browser has two modes of processing documents: HTML and XML. Usually the HTML-mode is used for webpages. XML-mode is enabled when the browser receives an XML-document with the header: Content-Type: application/xml+xhtml. In HTML mode tagName/nodeName is always uppercased: it’s BODY either for <body> or <BoDy>. In XML mode the case is kept “as is”. Nowadays XML mode is rarely used. The innerHTML property allows to get the HTML inside the element as a string. We can also modify it. So it’s one of most powerful ways to change the page. If innerHTML inserts a <script> tag into the document – it doesn’t execute. It becomes a part of HTML, just as a script that has already run. We can append “more HTML” by using elem.innerHTML+="something". But we should be very careful about doing it, because what’s going on is not an addition, but a full overwrite. elem.innerHTML = elem.innerHTML + "..."
The old contents is removed. The new innerHTML is written instead (a concatenation of the old and the new one). As the content is “zeroed-out” and rewritten from the scratch, all images and other resources will be reloaded. In the chatDiv example above the line chatDiv.innerHTML+="How goes?" re-creates the HTML content and reloads smile.gif (hope it’s cached). If chatDiv has a lot of other text and images, then the reload becomes clearly visible. There are other side-effects as well. For instance, if the existing text was selected with the mouse, then most browsers will remove the selection upon rewriting innerHTML. And if there was an <input> with a text entered by the visitor, then the text will be removed. And so on. Luckily, there are other ways to add HTML besides innerHTML, and we’ll study them soon. The outerHTML property contains the full HTML of the element. That’s like innerHTML plus the element itself. Beware: unlike innerHTML, writing to outerHTML does not change the element. Instead, it replaces it as a whole in the outer context. Yeah, sounds strange, and strange it is, that’s why we make a separate note about it here. Take a look. // Wow! The div is still the same! In the line (*) we take the full HTML of <div>...</div> and replace it by <p>...</p>. In the outer document we can see the new content instead of the <div>. But the old div variable is still the same. The outerHTML assignment does not modify the DOM element, but extracts it from the outer context and inserts a new piece of HTML instead of it. Novice developers sometimes make an error here: they modify div.outerHTML and then continue to work with div as if it had the new content in it. That’s possible with innerHTML, but not with outerHTML. We can write to outerHTML, but should keep in mind that it doesn’t change the element we’re writing to. It creates the new content on its place instead. We can get a reference to new elements by querying DOM. The innerHTML property is only valid for element nodes. Other node types have their counterpart: nodeValue and data properties. These two are almost the same for practical use, there are only minor specification differences. So we’ll use data, because it’s shorter. The textContent provides access to the text inside the element: only text, minus all <tags>. // Headline! Martians attack people! As we can see, only text is returned, as if all <tags> were cut out, but the text in them remained. In practice, reading such text is rarely needed. Writing to textContent is much more useful, because it allows to write text the “safe way”. Let’s say we have an arbitrary string, for instance entered by a user, and want to show it. With innerHTML we’ll have it inserted “as HTML”, with all HTML tags. With textContent we’ll have it inserted “as text”, all symbols are treated literally. The first <div> gets the name “as HTML”: all tags become tags, so we see the bold name. The second <div> gets the name “as text”, so we literally see <b>Winnie-the-pooh!</b>. In most cases, we expect the text from a user, and want to treat it as text. We don’t want unexpected HTML in our site. An assignment to textContent does exactly that. The “hidden” attribute and the DOM property specifies whether the element is visible or not. Technically, hidden works the same as style="display:none". But it’s shorter to write. value – the value for <input>, <select> and <textarea> (HTMLInputElement, HTMLSelectElement…). href – the “href” for <a href="..."> (HTMLAnchorElement). id – the value of “id” attribute, for all elements (HTMLElement). Most standard HTML attributes have the corresponding DOM property, and we can access it like that. If we want to know the full list of supported properties for a given class, we can find them in the specification. For instance, HTMLInputElement is documented at https://html.spec.whatwg.org/#htmlinputelement. Or if we’d like to get them fast or are interested in a concrete browser specification – we can always output the element using console.dir(elem) and read the properties. Or explore “DOM properties” in the Elements tab of the browser developer tools. Each DOM node belongs to a certain class. The classes form a hierarchy. The full set of properties and methods come as the result of inheritance. We can get nodeType from the DOM object class, but often we need just to see if it is a text or element node. The nodeType property is good for that. It has numeric values, most important are: 1 – for elements,3 – for text nodes. Read-only. For elements, tag name (uppercased unless XML-mode). For non-element nodes nodeName describes what it is. Read-only. The HTML content of the element. Can be modified. The full HTML of the element. A write operation into elem.outerHTML does not touch elem itself. Instead it gets replaced with the new HTML in the outer context. The content of a non-element node (text, comment). These two are almost the same, usually we use data. Can be modified. The text inside the element, basically HTML minus all <tags>. Writing into it puts the text inside the element, with all special characters and tags treated exactly as text. Can safely insert user-generated text and protect from unwanted HTML insertions. When set to true, does the same as CSS display:none. DOM nodes also have other properties depending on their class. For instance, <input> elements (HTMLInputElement) support value, type, while <a> elements (HTMLAnchorElement) support href etc. Most standard HTML attributes have a corresponding DOM property. But HTML attributes and DOM properties are not always the same, as we’ll see in the next chapter. There’s a tree structured as nested ul/li. The number of nested <li> – all descendants, including the deeply nested ones. Then we can get the number of descendants li.getElementsByTagName('li'). What does this code show? alert( body.firstChild.data ); // what's here? The content of <body> is replaced with the comment. The comment is <!--BODY-->, because body.tagName == "BODY". As we remember, tagName is always uppercase in HTML. The comment is now the only child node, so we get it in body.firstChild. The data property of the comment is its contents (inside <!--...-->): "BODY". Where's the "document" in the hierarchy? Which class does the document belong to? What’s its place in the DOM hierarchy? Does it inherit from Node or Element, or maybe HTMLElement? So, document is an instance of HTMLDocument class. What’s its place in the hierarchy? Yeah, we could browse the specification, but it would be faster to figure out manually. Let’s traverse the prototype chain via __proto__. As we know, methods of a class are in the prototype of the constructor. For instance, HTMLDocument.prototype has methods for documents. We also could examine the object using console.dir(document) and see these names by opening __proto__. The console takes them from constructor internally.